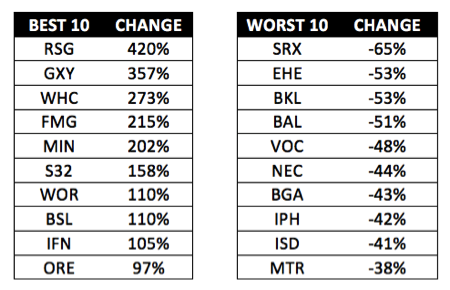 The lists of the best performing and worst performing stocks in the ASX200 during 2016 told a dramatic narrative of a reversal of fortunes between growth stocks and resource stocks. One month into 2017, and we have evidence of this continuing. BHP and RIO are up 11.2% and 14.4% year-to-date respectively. Meanwhile, several prominent growth stocks have had a rough start to the year, with Aconex being the latest market darling to be sold off more than 40% in a session after an earnings miss. As a backdrop, we have also seen bond yields start to tick up again. To gain an understanding of whether this is the beginning of a longer-term trend, and if it is, how to approach it, we asked Sean Fenton of Tribeca Investment Partners, Vince Pezzullo of Perpetual Equity Investment Company, and Simon Shields of Monash Investors for their views on this subject for Livewire’s first Buy Side Brief of 2017. The shift in performance over the last year, with resources doing better than growth stocks, is a reflection of what is occurring in the global economy. This is also captured in the bond market with yields moving substantially higher. We see this new trend persisting at least for the next year. Resources have been driven higher in part by stimulus in China with increased infrastructure spending and an easing of lending conditions for the property market, as well as by cuts to supply and a reduction in excess capacity. While China stimulus is likely to be supportive for demand this year, at the margin it is easing and we have already seen bulk commodities such as coal and iron ore peak out in price. The threat of a trade war also poses a lot of uncertainty around the path for China’s growth. We are more likely to see strength in energy with OPEC moving to support prices, and the excess supply of LNG in Asia dwindling. We are also more positive on US growth with many leading indicators of business confidence and investment swinging to the upside, which is likely to help broader cyclical stocks. On the other side of the coin to cyclical strength is the impact this has on the bond market where yields are moving higher. This move up in bond yields is likely to persist, particularly in the US as the labour market reaches full employment and drives wages and core inflation higher, and the impact of higher commodity prices flows through to headline inflation. This is not a positive environment for high PE growth stocks whose values are disproportionately impacted by higher bond yields. In this environment, highly rated stocks that disappoint at all on earnings will be dealt with harshly. Growth and yield stocks have had a strong run for several years and the unwinding of this “HIPP bubble” (Health, Infra, Property … and Pizza) has only just begun in recent months, and has a long way to unwind. We are also conscious that we may be at – or very close to – the bottom of the global interest rate cycle, which has driven the growth and yield stocks to these extraordinarily high levels. We think this is yet to be fully reflected in the market. Regarding resources, we are cautious as to whether this is a sustained bottoming of the sector or just another inventory re-stocking cycle. Resources stocks are increasingly not priced for the latter scenario. The last resources cycle was called the super cycle for a reason. Due to the rise of China, it was longer and stronger than usual and the subsequent decline in commodity prices was extended too. CY16 was the first year of the next cycle, so the performance of commodity related stocks was pretty spectacular, as they came back from near death experiences. Based on the past, resource stocks should continue to do well this year, but to nowhere the same extent, and by then we should be close to the up-phase of the cycle ending once more. Unsurprisingly, world growth, interest rates and inflation are somewhat correlated with commodity prices. US tax cuts and infrastructure spending will only throw fuel on the fire, so we expect earnings growth should pick up too. As this plays out growth stocks should perform again because right now, many growth stocks are very attractively priced.